Alejandro Valverde hasn?t succeeded overall in the Tour of Spain, but there?s no stopping his Caisse d?Epargne team from snapping up the stage wins. On Friday, thanks to David Arroyo, they took their second in 24 hours, and third of the race. Both of their latest wins, curiously enough, have been taken in two-rider duels. But if Thursday?s victory for Imanol Erviti could hardly have been closer – he just outsprinted Nicolas Roche (Credit Agricole) after the two had edged clear from a 17-man attack – then Friday?s win was a much clearer affair. Part of a three-man move with Vasili Kiryienka (Tinkoff) and Julien Loubet (Ag2R) that formed with 40 kilometres to go, Arroyo and Kiryienka got rid of the Frenchman on a small cllimb near the finish city of Segovia. But with Caisse D?Epargne driving behind, Arroyo had a cast-iron excuse not to collaborate, forcing Kiryienka to work himself into the ground. Come the final uphill finish in Segovia, Arroyo still sat on the back, coming round the Bylorussian with just a couple of hundred metres to go for his first ever win in a major Tour – and Caisse?s third in this year?s Vuelta. It wasn?t pretty, but as race strategies go it was brutally effective, and Arroyo was at pains to explain afterwards that he was only obeying orders. ?I really had no choice in the matter,? he commented afterwards. ?We were working for Valverde behind because we knew this uphill finish really suited him, and that meant I couldn?t do anything even though Kiryienka had asked me to collaborate.? Tenth in the 2007 Giro, Arroyo was due to lead Caisse d?Epagne there this year, but a crash just beforehand and a fractured wrist put paid to his chances. ?This definitely takes away the bad taste in my mouth I had after that,? Arroyo commented. Caisse d?Epargne had made a botched attempt to shake up the overall in the two first cat. climbs early on in the stage, with four riders ahead after 30 kilometres. Race leader Contador was down to just one rider – Levi Leipheimer – by the summit of the Navacerrada pass and it briefly looked as if the Vuelta could blow wide open. But the race then reformed after Andreas Klöden rejoined his two Astana team-mates and put in a massive turn that brought Contador across to the Caisse d?Epargne-led front group. After that, the only real battle was for the stage win. Saturday?s second-last stage should see Contador finally seal the overall, in the 17.5 kilometre mountain time trial. In his favour is his good form, and the fact he?ll start as last man off so will have the time references on all his rivals. 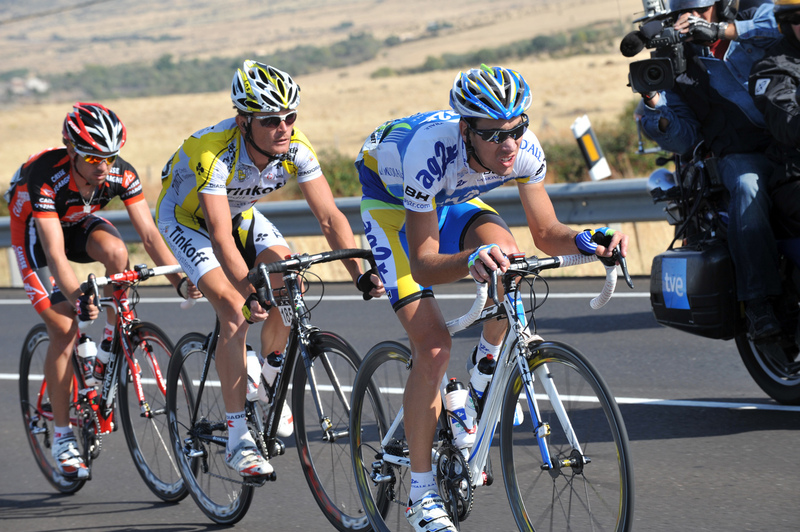 Plus Navacerrada is a climb Contador knows very well – he lives close by – and he has a 77 second advantage. Could second-placed Levi Leipheimer take a surprise victory? It might happen – in 2003 Roberto Heras did just that in the final Vuelta time trial at Abantos, when he beat ONCE?s Isidro Nozal. Watch this space.